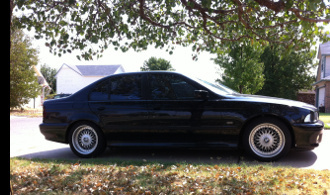 I am very knowledgeable about the e36 M3 and know the difference between the lux. and sport cosmetically. I was talking to a former e36 M3 owner who owned both sport and lux. model M3's and he claims that their is a big difference in suspension and ride height between a sport and a lux. I am trying to prove him wrong, but can't be sure if this is false. I know mechanically they are the same, but do the suspensions differ? even by the slightest shock mount or ball joint? To help your cause, I moved your thread to the E36 M3 forum. To my knowledge there is nothing different with the suspension. Not terribly familiar with the lux edition, but I know they got different seats, different side skirts, and wood trim interior. No engine, transmission or suspension change. Was the optional Luxury Package continued on North American 3.2-liter M3s? Yes. 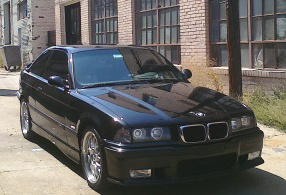 The Luxury Package option of the 1995 North American M3 continued unchanged (with the exception of additional leather on the seatbacks) for the later 3.2-liter model, but only on those built before September, 1997 (1996 and 1997 model years). The package was discontinued starting with the 1998 model year (9/97 production), at which time the front armrest became standard equipment (already standard in Canada) and the M Contour II wheels were offered as a no-cost option. Lux versions are generally less desireable. Last edited by egebhardt; 04-23-2012 at 12:32 PM. No proof but I think the suspensions were identical. I had a 95 Avus Lux w/ Champagne Leather before. The seats were powered and heated Sports, not Vaders, and were more comfortable for my lanky 6'2" frame. Wood on console, knob, and glovebox. It had an 18 button OBC, slat lower grill, non-twist skirts, 7.5" Contours, and dealer installed low-rise spoiler w/o 3rd brake light and CD changer. Coming from that Lux, I knew that my next Avus had to be a regular/sport w/o a sunroof, w/o a spoiler, and w/ manual, non-heated seats(it came with Vaders). welcome...now a factory spoiler is a whole other topic lol. search and you will see. there are a few different ones and its confusing because there are "Dealer installed" spoilers and "factory " spoilers. Look for the 3rd brake light in the window, that is the give away if its been a dealer installed. I have a few issues with the dealer installed ones. mostly because of fitment issues. You had an american fitter and painter slapping it on the car, so there are imperfections, paint runs and it just doesnt look right on every one i see in person. additionally, the cars with the factory spoilers come with different trunk shocks, since its so heavy, it doesnt weigh the trunk lid down when you operate the trunk. Sounds silly till you actually own one. With all that said, and on my 3rd E36, but first with the factory spoiler, I made certain while searching for the perfect car (which I found) not to get a dealer installed spoiler. Id rather not have one at all or have a factory one. thats it. Im picky about details and crappy fitment. Chrome inner door handles too on the Lux...but the same crappy, plastic, fall off every five minutes door handle surround. I like my Lux, had it for 12 years and it's always treated me right. Door panels and seats are so much nicer for a daily driver than the standard model. I like the Contours better too, but wheels are always subjective. Just a fyi, no such thing as a M3 "Sport". No reason to invent a name for what is otherwise just a M3 without the luxury package. The number of lux package cars is so small that one typically does not need to identify their car as being a non lux M3. On the other hand, using the word "Sport" only creates confusion for future owners and starts misconceptions that there might have been a M3 sport package with magical shocks and different diffs and what ever else one might dream up in internet lore. As to what others have answered, no difference in suspension. I owned both back when they were new. There is something that no one has mentioned yet. BMW had a range of springs it installed on E36 M3's, based on weight/options on the car. There were AC/NON AC springs for example. Not a issue here as all US cars had A/C. But there could have been a couple different springs available on US M3's based on what options they had relating to the weight of the car. A fully loaded car with power seats would have a different spring than a base car with manual seats and no sunroof. I believe the ETK has the spring chart and from what I remember there were basically 2 or 3 different springs one might have on a US E36 M3. The differences were very minor, like 1-5% difference so that all US M3's had basically the same ride height for US headlight and bumper Regulations. I also have to agree with the other poster than the Lux interior especially the door handles and leather made a difference. I always thought the non lux M3 interior was really bland and lacking quality. While I didn't care for the wood trim, the leather door inserts and wood door handle "felt" nice on my daily commute than the non lux interior. Same for the seats, far more comfortable for long trips than the Vaders which just did not fit my 6'2" frame at all especially around the shoulder area. I did change the front grill and add the lip, plus I liked the non lux side skirts better. Wow I had no idea they actually had differences in springs based on packages. Thank you for this information. 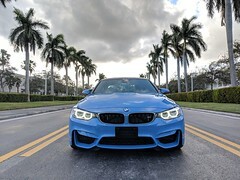 Sorry for calling the non lux M3 the sport. Somethings else I did not know... thank you for this bit of info. I prefer factory over dealer install, but its hard to find them these days. I just posted a thread about this, but I just noticed what appears to be a lumbar support switch on one of the seats to an M3 I was looking at earlier today. When did we have that as an option?!? !